Cookie Jar TV was an American children's programming block that aired on CBS, originally premiering on September 16, 2006 as the KOL Secret Slumber Party; the block was later rebranded as KEWLopolis (/ˈkuːlɔːpoʊlɪs/ KOO-law-poh-lis) on September 15, 2007 and then as Cookie Jar TV on September 19, 2009, running until September 21, 2013. It was originally programmed by DIC Entertainment, which over the course of the block's seven-year run, was acquired by Cookie Jar Entertainment and subsequently by DHX Media (both of which thereby assumed responsibility for the lineup). "KOL Secret Slumber Party" logo, used from 2006 to 2007. On January 19, 2006, two months after Viacom and CBS finalized their separation into two commonly controlled companies (both owned by National Amusements), CBS announced that it would enter into a three-year programming partnership with DIC Entertainment to produce a new weekend morning children's program block featuring new and recent series from its program library and included the distribution of select tape delayed Formula One auto races. DIC originally announced that the block would be named CBS's Saturday Morning Secret Slumber Party, however it was later renamed as the KOL Secret Slumber Party after DIC partnered with KOL, an AOL website aimed at children, to co-produce the block's programming. AOL managed the programming block's website, and produced public service announcements which aired both on television and online. This alliance, along with the fact that some CBS stations chose to tape delay some of the programs to air on Sunday mornings, was what led to the block's renaming. The KOL Secret Slumber Party premiered on September 16, 2006, replacing Nick Jr. on CBS (a block programmed by Nickelodeon, CBS' former sister property under Viacom ownership). Its inaugural lineup included two first-run programs (Cake and Dance Revolution), one that originally aired as a syndicated program as part of the DiC Kids Network block in 2005 (Horseland) and three pre-2006 shows (Madeline, Trollz and Sabrina: The Animated Series). The block's de facto hosts (and in turn, from whom the Secret Slumber Party name was partly derived from) were the Slumber Party Girls, a teen pop group signed with Geffen Records (composed of Cassie Scerbo, Mallory Low, Karla Deras, Carolina Carattini and Caroline Scott), who appeared during commercial break bumpers and interstitial segments seen before the start and the final segment of each program as well as serving as the musical performers for one of the series featured in the block, Dance Revolution. "KEWLopolis" logo, used from 2007 to 2009. In the summer of 2007, KOL withdrew its sponsorship from the network's Saturday morning block. CBS and DIC subsequently announced a new partnership with American Greetings Corporation to relaunch the block as KEWLopolis, debuting on September 21 of that year, which would be targeted at young female and male children and branded as a tie-in with the monthly teen magazine KEWL (which was established in part by DiC in May 2007; it is no longer in publication). Alongside Secret Slumber Party holdovers Cake and Horseland, the revamped block's lineup included the newly added series Care Bears: Adventures in Care-a-lot, Strawberry Shortcake and Sushi Pack. On June 20, 2008, Toronto-based production company Cookie Jar Group announced that it would acquire DIC Entertainment; the purchase was finalized one month later on July 23. On February 24, 2009, CBS renewed its time-lease agreement with Cookie Jar for three additional seasons, running through 2012. Subsequently on September 19, the block was relaunched again as Cookie Jar TV; with the exception of Strawberry Shortcake, most of the programs previously featured on the predecessor KEWLopolis and KOL Secret Slumber Party were dropped upon the block's relaunch. The theme song for the block was composed by Ron Wasserman. The Cookie Jar TV brand remained in place for the block following Cookie Jar Group's acquisition by DHX Media in October 2012. On July 24, 2013, CBS announced a programming agreement with Litton Entertainment (which already programmed a Saturday morning block that is syndicated to ABC's owned-and-operated stations and affiliates) to launch a new Saturday morning block featuring live-action reality-based series aimed at teenagers 13 to 16 years old. Cookie Jar TV ended its run after seven years on September 21, 2013, and was succeeded by the following week on September 28 by the Litton-produced CBS Dream Team. All of the programs aired within the block featured content compliant with educational programming requirements as mandated by the Federal Communications Commission via the Children's Television Act. Though the block was intended to air on Saturday mornings, like its predecessors, some CBS affiliates deferred certain programs aired within the block to Sunday mornings, or (in the case of affiliates in the Western United States) Saturday afternoons due to breaking news or severe weather coverage, or regional or select national sports telecasts (especially in the case of college football and basketball games) scheduled in earlier Saturday timeslots as makegoods to comply with the E/I regulations. Some stations also tape delayed the entire block in order to accommodate local weekend morning newscasts, the Saturday edition of The Early Show and later its successor CBS This Morning or other programs of local interest (such as real estate or lifestyle programs). Cookie Jar Kids Network – a syndicated children's block produced by Cookie Jar that ran from 2008 to 2011. 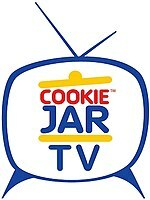 Cookie Jar Toons – a Cookie Jar-produced daily children's program block that ran on This TV from 2008 to 2013. ^ Elizabeth Guider (January 19, 2006). "Synergy not kid-friendly at Eye web". Variety. Reed Business Information. Retrieved August 13, 2009. ^ a b "DIC's CBS block looks to reach girl viewers" (PDF). Kidscreen. May 2006. p. 28. Retrieved 2017-08-22. ^ "DIC, KOL to Produce on CBS". Mediaweek. June 21, 2006. Archived from the original on 2006-07-13. ^ "CBS Blocks Out KEWLopolis". Animation Magazine. August 23, 2007. ^ "DIC reaches out to boys amid block revamp" (PDF). Kidscreen. May 2007. p. 33. Retrieved 2017-08-22. ^ a b "CBS Sets Lineup for Cookie Jar Block". WorldScreen. September 4, 2009. Retrieved September 10, 2009. ^ "Zeroing In". Kidscreen. May 8, 2009. Retrieved July 14, 2009. ^ Wasserman, Ron. "Cookie Jar TV - Theme CBS". SoundCloud. Retrieved January 6, 2017. ^ Meg James (July 24, 2013). "CBS partners with Litton Entertainment for Saturday teen block". Los Angeles Times. Tribune Publishing. Retrieved July 25, 2013. ^ "CBS AND COOKIE JAR ENTERTAINMENT PRESENT THE NEW CHILDREN'S EDUCATIONAL AND INFORMATIONAL PROGRAMMING SCHEDULE FOR "COOKIE JAR TV" PREMIERING SATURDAY, SEPT. 17". Cookie Jar Group. September 6, 2011. Archived from the original on July 30, 2012. Retrieved September 18, 2011. This page was last edited on 10 April 2019, at 00:33 (UTC).